We kid-tested this recipe during a soup class, and it turned out to be the perfect crunchy match for our Souper Lima Bean Soup. It would also be wonderful for the warmer picnic months as a cool, refreshing side salad. This salad is SUPER PURPLE, which means TONS of immune building antioxidants to keep families healthy and strong! Challenging kids to eat five natural colors of the rainbow everyday can be a great way to inspire young eaters to eat a healthy variety of whole foods. Soak the raisins in the vinegar and orange juice for 10 minutes. Strain and add soaking liquid to a bowl with brown mustard, olive oil and orange zest. Whisk or shake (if using a jar with a lid). Season with salt and pepper. 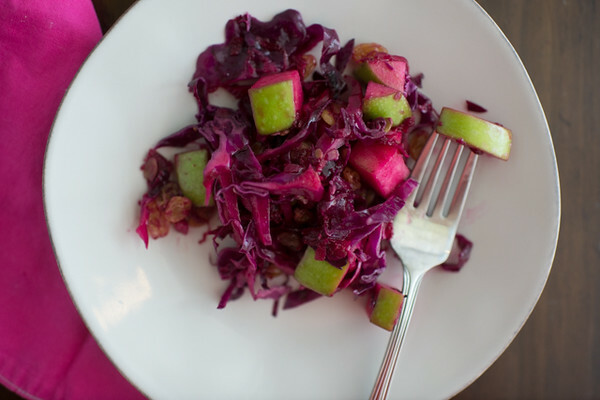 Combine raisins, cabbage, beets, apples and onion in a bowl. Add salad dressing and toss. Top with toasted pumpkin seeds.